A new discovery by physicists at the University of Maryland could hold the key to the construction of inexpensive, broadly useful, and portable particle accelerators in the very near future. The team has accelerated electron beams to nearly the speed of light using record-low laser energies, thus relieving a major engineering bottleneck in the development of compact particle accelerators. The work appears in the November 6, 2015 issue of the journal Physical Review Letters. 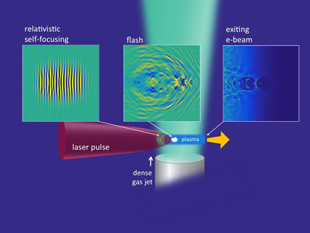 The research paper, “Multi-MeV electron acceleration by sub-terawatt laser pulses,” Andrew Goers, George Hine, Linus Feder, Bo Miao, Fatholah Salehi, Jared Wahlstrand and Howard Milchberg, was published in the November 6, 2015 issue of the journal Physical Review Letters.